Axol Bioscience specialises in human cell culture, providing customers with all relevant media and related bespoke differentiation services. 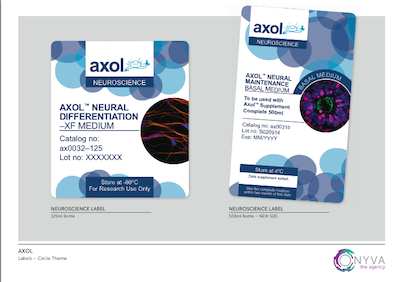 We helped Axol Bioscience with a company rebrand, including branding guidelines, logo re-design, product line logos, product labels and design elements for use across all company materials and exhibition booths. Additionally, we have produced literature and advertising for print and digital distribution for Axol Bioscience, to highlight their key products.